Are you wondering how to promote an event with social media? Whether you have a small local gathering or a large conference, social media can be used to get the word out in a powerful way. In this article I’ll reveal 10 creative ways to use social media to increase your chances for a gangbuster event. Because events take place in person, they engage the senses in a way online content can’t. Creating a stellar video with great visuals and sound can not only help drive people to your event, it also increases the chances people will want to share it with friends. 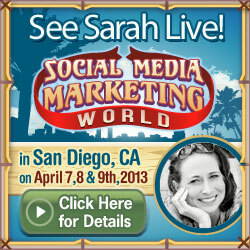 Check out this video from Social Media Marketing World 2013 for creative ideas. Leverage it everywhere, including on your event page, in articles and with affiliates. Click here to see how we used it on our event page. Host on Vimeo and YouTube. We host the video in both places to take advantage of the flexibilities of each platform—Vimeo’s branding control and YouTube’s access to a large audience. Upload to Facebook. This maximizes your exposure on Facebook. Focus on the value for attendees. In the above video, you’ll notice it is all about what folks will gain by attending. Nothing motivates people more than the opportunity to win something free! So why not give away a ticket or two for your event to really amp up the buzz? Contests provide a rapid way to generate interest in your event—especially if you have the right prizes. 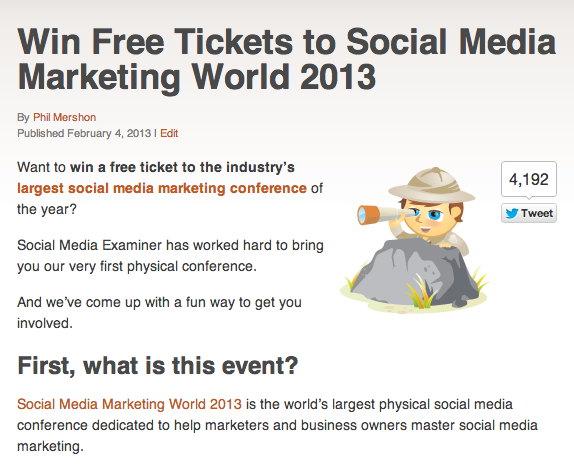 Here’s a sample from the thousands of folks who wanted to win free tickets to Social Media Marketing World. We start with a blog post where we describe the prize (the event!) and then how to participate. Here’s what a free ticket contest can look like. Recruit judges who will help extend the reach of the contest. Keep the requirements super-easy to maximize participation. For example, a simple one-click tweet to enter is ideal. Run your contest at a time that will be helpful to your sales cycle. If you have a podcast, consider creating a special episode explaining the contest. Are you using Google AdWords to promote your event? Do you have a Google+ page? If so, you can actually add social proof to your paid Google ads. This increases the credibility of your ads. Notice how this ad for Social Media Marketing World showcases how many people follow our Google+ page. You can add social proof to your Google ads by going under Ad Extensions and selecting Social Extensions from the drop-down menu. Here is an article on how to do this. A main reason people attend events is to meet the presenters. And getting exposure is often why many experts speak at events. You can create great content that is valuable for all by simply interviewing your speakers. This works great if you have a podcast. 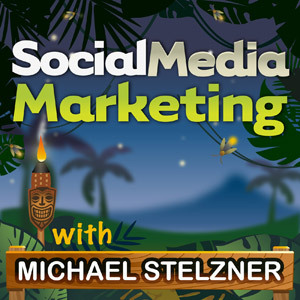 In the months leading up to Social Media Marketing World, I interviewed many of the presenters from the conference for our Social Media Marketing podcast. We did NOT talk about the event at all. Instead I focused on exploring the expertise of the presenter and creating quality content. At the end of the podcast, I mentioned that listeners could meet the interviewee live at our event. Chances are you have great insight locked inside the minds of your event speakers. Why not pool that knowledge into a great blog post? This is where you ask experts to contribute a short writeup on their favorite tip, tool or perspective on a specific topic. These types of articles are a great way to involve the experts and they provide ongoing exposure for your presenters. Leverage the collective insight of your presenters in a blog post. Here’s a tip: Include a mention of your event at the end of each article. Click on one of the articles above to see how we do it. Who doesn’t love to see their face in a cool sign? Well, speakers are often very fond of this. You can encourage presenters to place these on their blogs, in Facebook updates and much more. In fact, you never know where those images might show up! 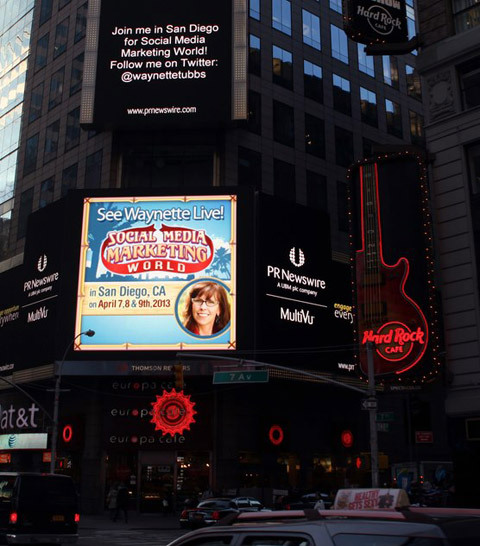 Social Media Marketing World speaker Waynette Tubbs had her picture and our event show up in Times Square. If people are excited about attending your event, why not ask them to click a button and tell their friends about it? This is something easy that you can place on the “Thanks for Registering” page. Click here to create the code for a customized tweet and be sure to customize the “tweet text”. You can create a simple custom tweet for attendees. If people are talking about your event on Twitter, why not take advantage of that social proof to encourage new site visitors to attend? Twitter has a cool widget that scrolls all the tweets for you. This Twitter widget scrolls all relevant tweets about your event. The great thing is you can include OR exclude Twitter search terms using Boolean logic. NOTE: This Twitter widget code is hard to find, so I’ve included it below. You can customize the red text and paste it into your site. A Facebook event listing provides an easy way for attendees to share your event with their friends. Each time someone shares that they are attending your event creates the potential to drive more people to your Facebook Page. A Facebook Event Page is also a channel for asking questions, providing an alternate means of customer service. You can also @tag event names in your Facebook Page updates. Facebook’s event listings provide an easy way to invite speakers and friends to share their attendance. Tip: Encourage attendees to visit your Facebook Event Page and see who else is attending. Facebook allows advertisers to remarket to people who have visited specific non-Facebook Pages using Facebook Exchange, also known as FBX ad targeting. This means you can show event ads to Facebook users who visited your Event Page but did not purchase. This can be a very economical way to retarget possible prospects. An FBX ad shows up like other Facebook ads in the sidebar of the news feed. To learn more about these types of ads, check out this article. What do you think? Have you tried any of these? Share your thoughts and ideas in the comment box below.